The blood streaming down my arm tells me it’s Friday the 13th again, and time for a quick post before I bleed out. Not to worry, folks. It’s not a mortal wound. Just a little tasty taste for the demons of the day. My cat, Jerry, seems to have picked up the scent. He just hopped onto my lap for a lap. Ha! Lap for a lap. That was either really funny, or I’ve lost more blood than I thought. Oh, definitely the latter. Jerry said so. 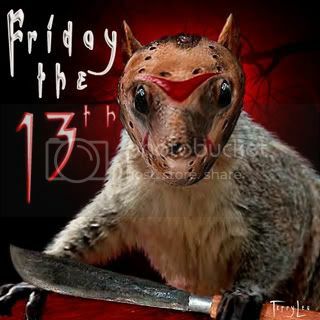 Anyway, I could not let the day pass without a quick post to say Happy Friday the 13th! I hope you all have strange encounters with black cats followed by near-death experiences that leave you happy to be alive. We could all use such motivation every now and then. Celebrate with a horror movie marathon and lots of booze. Maybe red wine is appropriate. Have a great day. And watch your step.